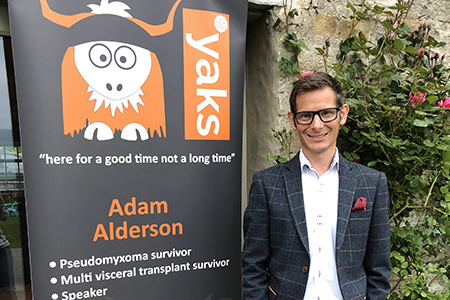 Adam Alderson is 1 of 4 people in the world to have survived a gruelling 8 organ transplant, along with radical tumour de-bulking surgery for a rare form of cancer Pseudomyxoma Peritonei. Over the last 3 years, Adam has gone from lying in a hospice bed, being fed through a small tube into his stomach, to defying all odds, showing his true grit, and proving his doubters wrong. Adam now constantly demonstrates how organ donation can provide someone suffering with a terminal diagnosis, a full and active life style. Whilst recovering in hospital after his transplant, Adam decided he wanted to take on one of the worlds biggest motoring challenges  The Mongol Rally. In July 2017, Adam and his new wife Laura, embarked on their epic adventure, aiming to raise over £30k for their chosen charities whilst raising awareness of his condition and cure. Adam is a passionate and able speaker who has the audience gripped with his story and positive approach to life. - campaigning for organ donation.